When Duluth’s Union Depot was constructed in 1892, it helped cement Fifth Avenue West’s status as an “entrance” to the Zenith City. The grand Lyceum Theatre and luxury hotels like the St. Louis and the Spalding already stood nearby, as did many other, lower-rent hotels and saloons, many of which catered to lumberjacks, miners, and sailors between seasons with time on their hands. By 1894 Reverend C. C. Salter—whose Bethel on South Lake Avenue ministered to those suffering from alcoholism—decided to open another Bethel along the 500 block of Michigan Street. The surrounding area—essentially Fourth Avenue West to Mesaba Avenue along Michigan and Superior Streets—became known as The Bowery. (Like many communities across the U.S., Duluth’s Bowery was named for a section of Manhattan notorious for similar social problems.) Prohibition didn’t end the Bowery’s ills, and the city’s clearing of saloons and brothels on Minnesota Point between South Lake Avenue and St. Croix Avenue in the 1930s only increased the Bowery’s marginalized population. After World War II, the area became populated by retired laborers with no pensions and troubled young men returning from service overseas. Many had alcohol problems. In the 1950s urban renewal projects swept the nation, trying to eliminate perceived blighted areas to increase urban business opportunities while populations moved out of cities and into suburbs. Duluth targeted the Bowery with its Gateway Urban Renewal Project. The city began purchasing and condemning almost every building in the Bowery and many on First Street west of Fifth Avenue. By 1970, nearly all had fallen. Many of the razed buildings had once been significant architectural and cultural landmarks, including the McKay Hotel, Holland Hotel, Spalding Hotel, and Lyceum Theatre. Most, however, were not, and many contributed to the Bowery’s social ills. They included the Cleft Hotel, Grace Hotel, Saratoga Hotel, Perovich Hotel, Hill Hotel, Hotel Liberty, Royal Hotel, Park Hotel, First Street Hotel, Sixth Avenue Hotel, Fifth Avenue Hotel and Lamplighter Lounge, Rex Hotel and Eagle Tavern, Salena Hotel and Tavern, The Classy Lumberjack, Green’s Crystal Terrace, Pal’s Corner Tavern, Soder’s Bar, the original Club Saratoga, and the Union Liquor Depot. Other businesses fell as well: The Moose Lodge Hall, Chief Motors auto storage, M & M Supply Company, Mork Food Supply, Minnesota Woolen Company, Dove Clothing Company, Al’s Grill, and the St. Paul Restaurant. The Union Gospel Mission, which was there to help the Bowery’s residents, also came down, as did two houses. The 1894 fire station on First Street and a gas station on Superior Street were supposed to remain, as were the Holland House and Fifth Avenue Hotel, but in the end all were demolished. The Soo Line Depot was to be saved and turned into the Saint Louis County Heritage and Arts Center but its basement filled with water, damaging the foundation beyond repair. The Union Depot, slated for demolition, became the Center. 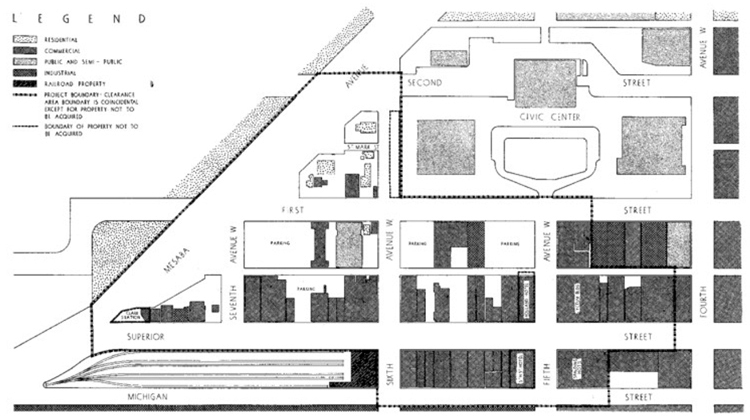 In the 1960 s and 1970s new buildings rose in the former Bowery, including the Ordean Building, Duluth Public Library, KDLH TV studios (demolished in 2014 for the Maurice’s Building), the Duluth News Tribune Building, the Radisson Hotel, the Incline Station, and the Gateway and Lenox Towers senior high-rises; none are considered great architectural achievements. The entire “gateway” concept was compromised in the 1980s when the expansion of I-35 allowed drivers to bypass downtown.